This article is by Alaric Nightingale. It appeared first on the Bloomberg Terminal. The oil industry needn’t be too concerned, for now, about how Tesla Inc.’s electric cars are denting demand. China and its bus fleet could be more of a worry. 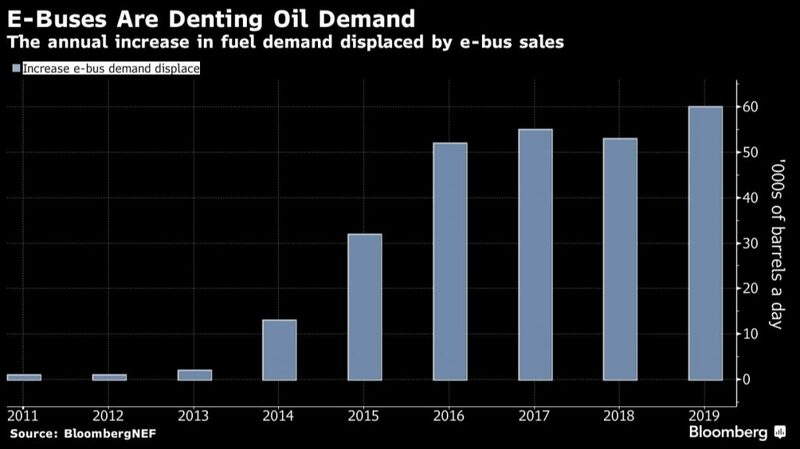 By the end of this year, a cumulative 270,000 barrels a day of diesel demand will have been displaced by electric buses, most of it in China, according to a report published last week by BloombergNEF. That’s more than three times the displacement by all the world’s passenger electric vehicles (a market where Tesla has a share of about 12 percent.). Despite rapid growth, the impact on the oil market from electric vehicles remains relatively small. Collectively, buses and electric vehicles account for about 3 percent of oil demand growth since 2011, and 0.3 percent of current global consumption, according to BloombergNEF figures and data from the International Energy Agency. Buses matter more because of their size and constant use. 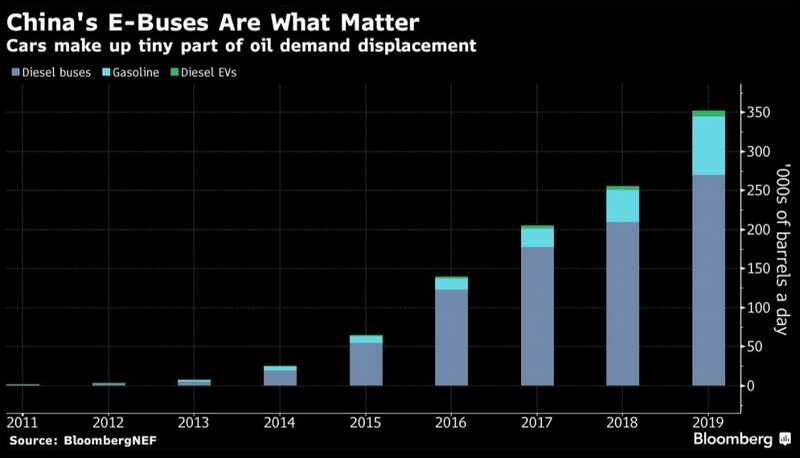 For every 1,000 electric buses on the road, 500 barrels of diesel are displaced each day, BloombergNEF estimates. By comparison, 1,000 battery electric vehicles remove just 15 barrels of oil demand. Still, the EV market’s impact on oil consumption is only going to grow. By 2040, electric vehicles could displace much as 6.4 million barrels a day of demand, while fuel efficiency improvements will erase another 7.5 million barrels a day, according to BloombergNEF’s May 2018 long-term EV outlook. BNEF clients can access the full report, How Much Oil Are Electric Vehicles Displacing? : 2019 Edition, on the Terminal or on web.